The SP SportMaxx GT 600 delivers high levels of wet and dry grip to answer the demands of sport driving. It uses silica to maintain flexiblity on rain covered surfaces. Carbon particles in the compound help to ensure good dry grip, for improved braking and acceleration. Get maximum driving enjoyment when traveling at speed. 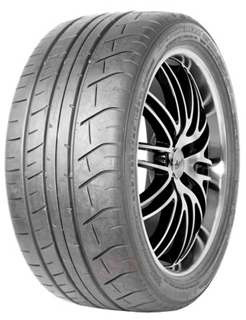 The tread features large shoulder blocks and continuous center ribs for precise cornering and steering. Straight central grooves maximise water dispersal to ensure safer driving in heavy rain conditions. Dunlop’s Jointless Band Technology maintains tyre shape at high speeds, giving you a smoother ride while also maximising steering control.